Firefox. I love this browser. 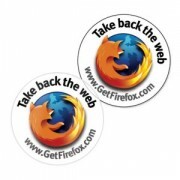 If you have not heard of it or tried it, the Firefox browser is great. I have been using the browser for many months on both Windows XP and OSX. What do I like? -Its much faster than IE -Its safer. Less spyware and viruses. -Themes. The look is customizable. -Did I mention it was fast? -Tabbed browsing rocks! -Its better than Safari. Download it now, and take back the web.